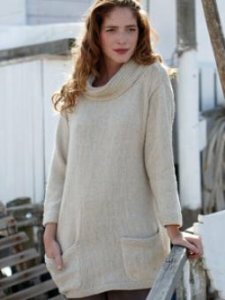 Taken from Rowan Seascapes: This long sleeved tunic is the quintessential summertime cover-up for cool evenings! Gauge: 21 sts and 28 rows over 4" in St st.
Color Shown is 621 Natural. $134.55 -- Kit price including yarn only (no book or pattern). $149.50 -- Kit price including yarn only (no book or pattern). $164.45 -- Kit price including yarn only (no book or pattern).